Trim but stout looking, with a widow’s peak the curves of which seem to raise the eyebrows on his armadillo face, giving him a look not of surprise but of perpetual sympathy and amusement, the tango singer Ariel Ardit could be a clown or comedian were it not for his consummate posture and deportment, strong, open-chested but relaxed, the picture of confidence and bygone elegance. He evokes the stylishness of another time, the Golden Age of tango, or, further back, of Gardel himself, at his best-dressed, most smiling and debonair, but Ardit is, of course, of this time. His voice is contemporary, but with a polish that belies it, for he will not fall into, or validate, the cult of the casual, the slovenly, or proudly untrained, and, although he possesses great emotion, he shapes rather than flaunts it. He offers a corrective to the historical machismo of the genre, making of the tango canción an emotional gift instead of a cry for approval or self-justifying display of sensitivity. That is, as it happens, very much what Carlos Gardel did, and one reason he sounds, not just better every day, but more and more radical. He was more dashing than macho, forgiving than hurt, holding, in value but without wallowing, the memory of loss, neither injured male nor sensitive man. Ardit is no Gardel, nor claims to be, but he understands what made him great and in every way matchless. 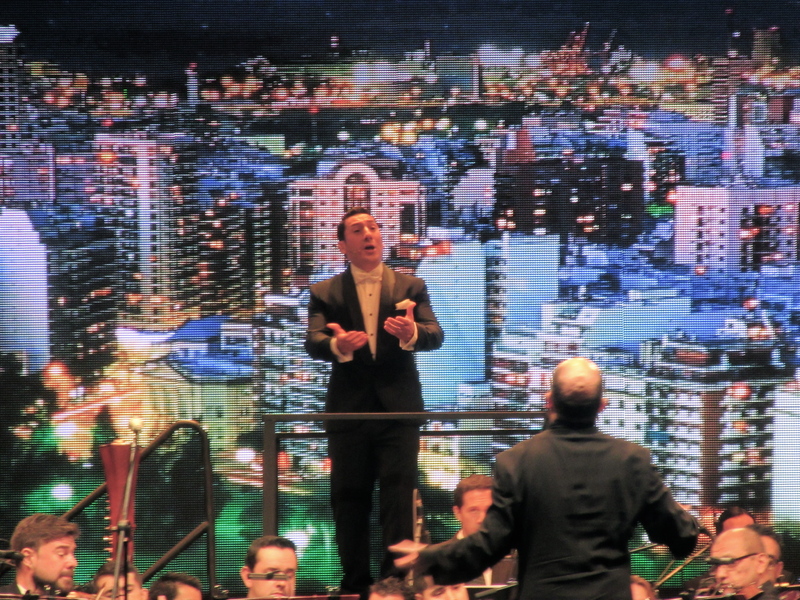 The first sight of him, Wednesday night in Medellín, was before a pixelated backdrop of Buenos Aires, singing Gardel’s signature homage to the city, “Mi Buenos Aires querido,” his voice borne by the swell of Gonzalo Ospina’s Orquesta Filharmónica de Medellín. He would, later, mirror Gardel’s projected image, walking up a stair in one of his movies, like a shade or a doppelgänger, something more, anyway, than just following in his footsteps, but without the hubris of stepping into his shoes, and, later still, enact, with names changed, the famous scene in the movie El día que me quieres, on a bench under the night sky, in which Gardel sings, to his beloved, the title song. There was, in the event, an actual night sky, over the stage at Plaza Gardel at Aeropuerto Oyala Herrera, the very one into which Gardel failed to fly on the same day eighty years before. The concert was separated by the width of an airport terminal from the field on which Gardel died, in a runway collision, along with his lyricist, Alfredo Le Pera, musicians and associates, and the pilot. Thus when, at the end of the concert, film was shown of Gardel in Medellín, and a plane, presumably his, was seen speeding to takeoff, we all feared, I think, that the crash itself, of which footage exists, would be shown. Instead, an animated image took its place, of the plane rising, to cheers from the crowd, flawlessly through the sky, as Ardit sang the Gardel anthem “Volver” (“To return”), as if Gardel, in some other universe, made it back to his Buenos Aires, querido. This was perfect dramatic structuring, and whoever put Carlos Gardel: Homenaje Sinfónico together for the IX International Tango Festival of Medellín, singly or collectively, deserves high praise. Ardit was just the singer to carry it off. With his suavity, smooth phrasings, and physical repose, he evoked Gardel while avoiding the trap of imitation. The homage was both tasteful and sentimental, no small feat, and thought-provoking, for Gardel was one who set the pattern, in the celebrity culture of the 20th century, of beloved figures converted by sudden death into icons and their lives into Romantic tragedies. Gardel, the Kennedys, Princess Di and their like projected a kind of life-loving recklessness that resonated, somehow, in the manner of their deaths. It represents a different sort of death than that of an Elvis or a Philip Seymour Hoffman who, however great their talents, died in ways untouched by joy. It is as though Gardel had a life force so strong that he had to live on, not only in memory, but as symbolic touchstone. Medellín’s homage, with Ardit at the center, caused a loss eighty years old to still seem palpable, but filled it with something ongoing, of iconic force and the life it carries. Click here for more on Ariel Ardit. Visit the International Tango Festival of Medellín for information on the annual event.